Over the Rainbow: Happy Fourth! Happy Fourth of July everyone! 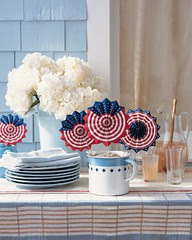 I'm looking forward to spending most of the day with family and going to a friend's BBQ in the evening, but before I go, I wanted to share some fun Fourth of July inspiration I discovered on Pinterest! I have a not-so-little "thing" for chocolate dipped strawberries. I always want to buy one at Godiva, but they run something like $8 a berry. 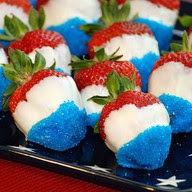 So needless to say, I'm VERY excited by this patriotic strawberries. I like how it's fun and flirty and color appropriate without being over the top. and tags for beverages, oh my! And last but not least, I LOVE a good tablescape. 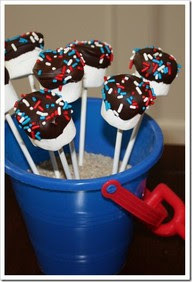 What are YOUR plans for the Fourth? And are there fireworks involved? 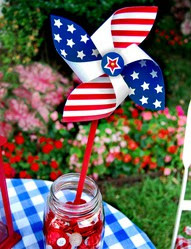 LOVELY eye candy today - makes me smile :) Have a great 4th!! Fun ideas! 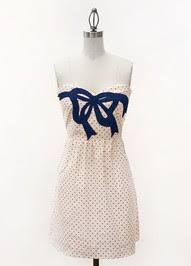 I love that dress! Just made those strawberries this morning after seeing them on pintrest - taking them to a BBQ - and they are wicked easy and super tasty - looks just like the picture and I have no kitchen talent! You have to love reasons to celebrate and make silly things! love all those ideas!! have a happy 4th!! Looks like your plans were fun! I went to a friend's house and hung out with their kiddos. It was simple, relaxing and fun.